Those of you who know The Geeks know of our love of craft cocktails. One of our favorite spots to get them is Counter Intuitive in Old Town Scottsdale. The time has come to say good bye to Counter Intuitive’s current concept, Shanghai Social (Egg Shen, you will be missed) and welcome the new concept, Agua Caliente Opening Day 1929. 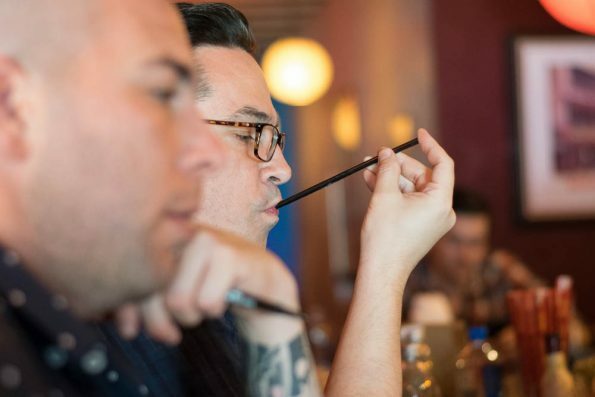 Inspired by Counter Intuitive’s director of beverage development, Jason Asher’s love of agave spirits and the challenge of creating a prohibition style bar in a time when people have been burnt out on the theme, patrons will experience the prohibition style bar in a way that they never have before. They will also be exposed to flavor combinations and agave spirits they have likely never heard of. For a bit of back history, Agua Caliente was a lavish resort and racetrack built in Tijuana, Mexico. Prohibition gave rise to the border town bars and clubs as drinking was not illegal in these places. Celebrities and the elite flocked to places like Agua Caliente to drink, gamble, and live the high life. This made Agua Caliente one of the most popular prohibition era resorts. We recently were invited to attend the last R&D session for the 4th episode where we got to try a drink from each of the bartenders. What was great about the drinks we tried, was that they reflected their bartender in concept and flavor. Kiefer Gilbert, Jason Asher, Mari Howe, and Clint “Spotty” Spotleson all presented one of their creations (all of which are named for horses who raced at Agua Caliente). After we tried them, we were allowed to watch some of what goes into creating a new drink. The first cocktail we tried was Kiefer’s Gallant Sir. It features cantaloupe syrup, reposado tequila, bitter orange liqueur, bacanora, Islay scotch, lime, and muddled fresno chile. Like Keifer, it is young, fresh, and unexpected. 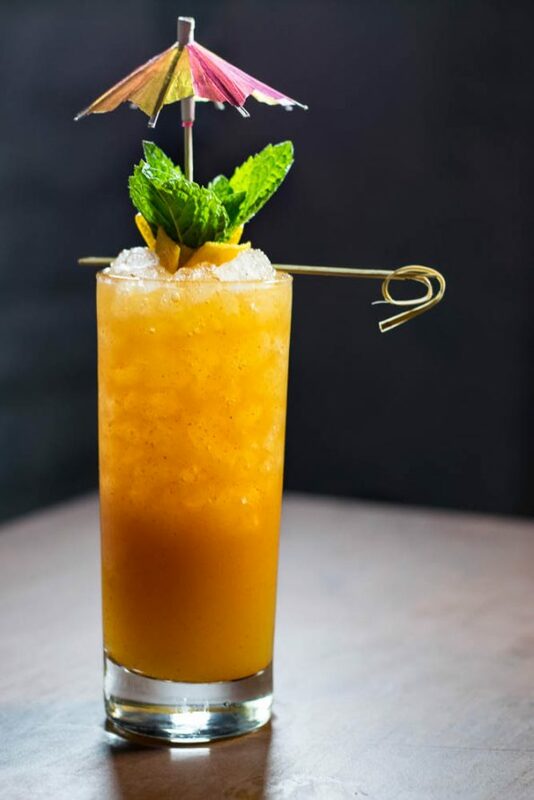 The use of bacanora (a smoky agave spirit) and Islay scotch would lead you to expect a super smoky cocktail but the use of cantaloupe syrup and reposado balance the smokiness making a drink that is perfect for exposing people to the world of smokier spirits. Following the Gallant Sir, we tried Jason’s Onrush. 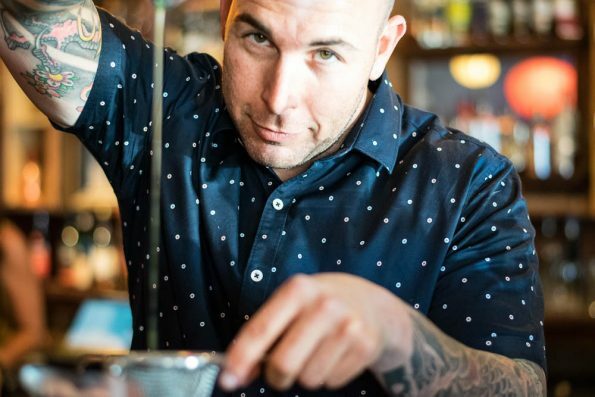 The flavors in Jason’s cocktails match his personality: deliberate, upfront and created with obvious experience. Using tequila, Genepy des Alpes, St. George Green Chile Vodka, poblano syrup, pineapple syrup, and lime. 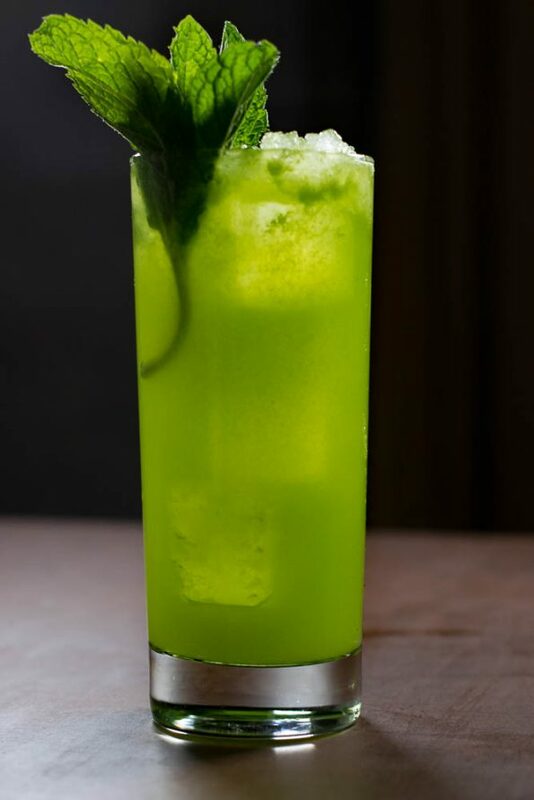 The poblano syrup in this cocktail combined with the green chile vodka create a spicy cocktail that isn’t masked entirely by fruit. In fact, the pineapple enhanced the spicy flavors. Rest assured, it was garnished with Jason’s trademark mint top garnish. Speaking of garnishes, the next cocktail we sampled was Mari’s Golden Prince. Brains and beauty are descriptors that match not only the Golden Prince, but Mari as well. Mari’s garnish game in unparalleled and this drink is no exception. 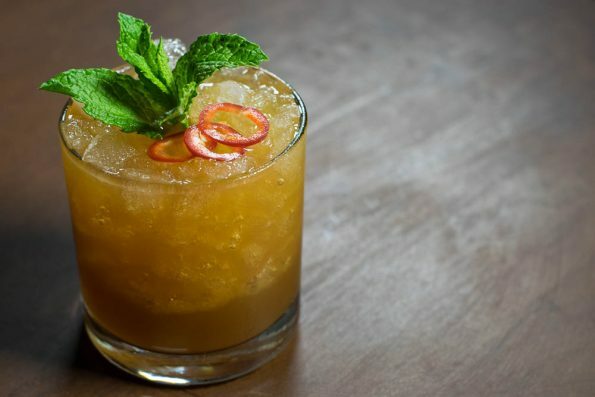 This well thought out cocktail features: tequila, amaro, Tapatio hot sauce, orgeat, passion fruit, lemon juice, and tiki bitters. The brains behind this drink truly lies in the fact that despite having Tapatio sauce in it, the drink takes the heat from the popular hot sauce but very little of its vinegary flavor. The last cocktail served was The Little Nymph made by Spotty. 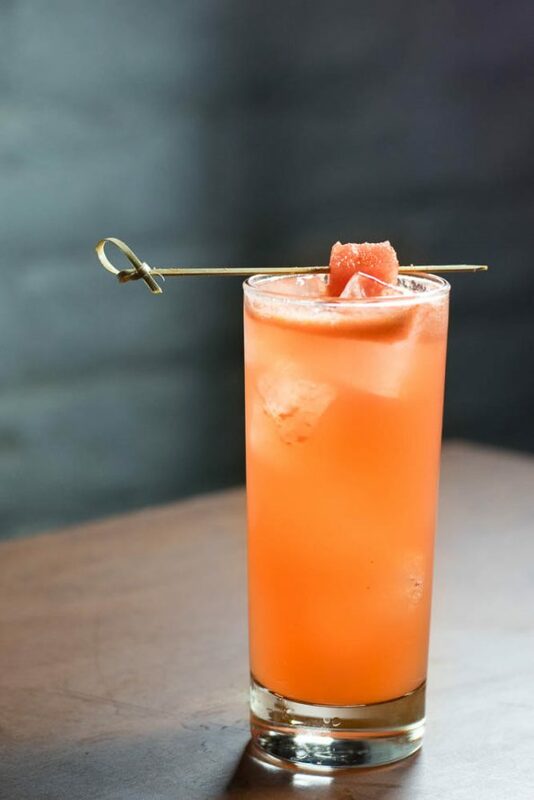 Like Spotty, the cocktail is inventive and out of the box with sherry, Campari, vodka, watermelon syrup, cherry tomatoes, and lime juice, garnished with chili-dusted watermelon. If you’ve ever had any of Spotty’s drinks, you’ll recognize that he is always pushing the boundaries with his ingredients. This drink is also one of the few drinks on the menu not to feature an agave spirit. Thus like Spotty, standing out in the crowd. Following our delicious cocktails, we were treated to a preview of Chef Garrison Whiting’s new menu for the Agua Caliente episode. While we will miss Shanghai Socials Deconstructed Crab Rangoon, we are excited for tacos, tortas, and breakfast burritos galore! 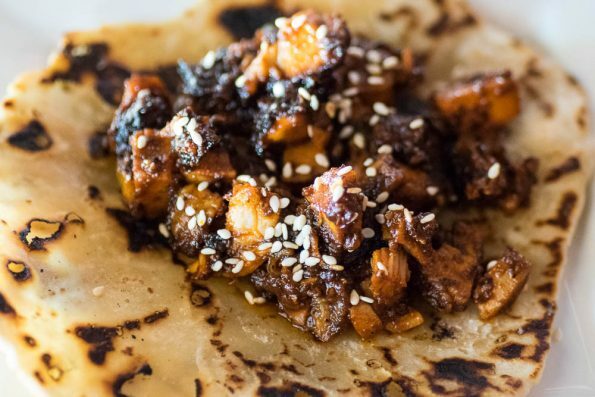 The mole chicken taco is one of a few taco options to be offered. With house made tortillas and chicken thighs, these tacos pack a flavorful punch (and we know tacos). Next we tried the breakfast burrito, which is definitely going to be a popular post drink menu item! Loaded with bacon, chorizo, egg, green chile, American cheese (it sounds odd, but we promise you, it is AMAZING), and a tomatillo avocado salsa verde, this burrito means business. The menu item we tried was the breakfast torta. The torta is a Milanesa style torta with a piece of breaded and fried chuck steak, cotija mayo, pickled red onion, avocado and fried egg. After eating this torta, we know that nothing on this menu will be bad. As with the Shanghai Social menu, everything is absolutely fantastic! Counter Intuitive’s new concept opens to the public on May 6th. Patrons will be delighted to know that in addition to new cocktails, decor, and food, Counter Intuitive will have new hours! Opening will now be at 8pm instead of 10 pm. That means that there are now 4 more hours a week to enjoy Counter Intuitive! Stay tuned because we will definitely be writing more about their new concept once it is open to the public.